Mine: Charming and intersting movie about mostly not so charming people. The credit goes to the writer and director for making this work. Jack is as strange and distasteful as always but they make you like him by the end of the film. The Kinnier character also starts out anoying but ends up very simpathetic. Helen is great as always. Very powerful story about the effect that people have on each other. 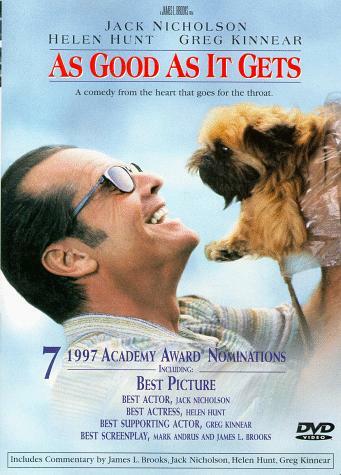 Leonard Maltin/Plot synopsis: Professional malcontent (and full-time phobic) Nicholson is unavoidably drawn into the lives of his favorite waitress and his gay next-door neighbor. Gradually, and against his own judgment, he begins to show signs of humanity. Wonderful comedy-drama (written by Mark L. Andrus and Brooks) takes the viewer on an emotional journey, with laughs and tears along the way. Both Nicholson and Hunt won Oscars for their roles. Writer-directors Harold Ramis, Lawrence Kasdan, Shane Black, and Todd Solondz all have small roles. (out of 5 stars) Never understood the hoopla over this movie. No big deal.